Eric Idle reveals how a Beatle saved Life of Brian . Beatles Radio: The Beatles, Solos, Covers, Birthdays, News The Fab 4 and More! 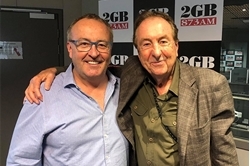 British comedy legend Eric Idle has joined Chris Smith in studio, and he’s come armed with some extraordinary tales. The Monty Python co-founder is behind some of the world’s most famous sketches. His new “sortabiography” entitled Always Look on the Bright Side of Life, gives us a peek behind the curtains of his remarkable life. In a broad interview with Chris Smith, Mr Idle touches on everything from his difficult upbringing to jamming with the Rolling Stones. He’s also detailed his close relationship with The Beatles guitarist George Harrison and reveals the now iconic Life of Brian wouldn’t have gone ahead if it weren’t for George. “He mortgaged his house for $4.5 million and put it all for the budget of Life of Brian.